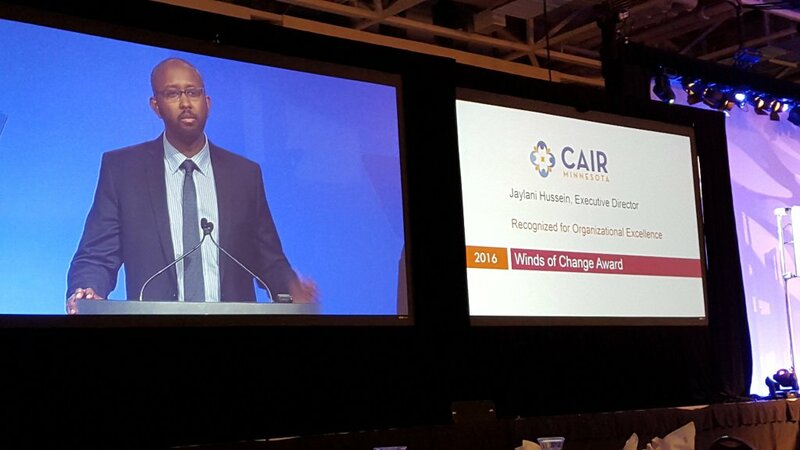 (MINNEAPOLIS, MN, 4/1/16) - The Minnesota chapter of the Council on American-Islamic Relations (CAIR-MN) has received the 2016 Winds of Change diversity award from the Forum on Workplace Inclusion, in partnership with the University of St. Thomas - Opus College of Business. 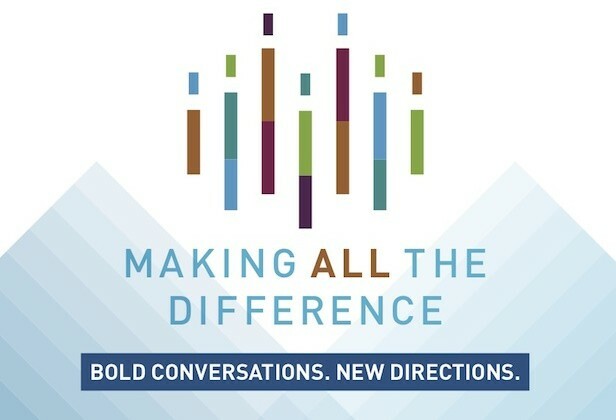 The Forum is the largest diversity and inclusion conference in the country. The Winds of Change Award goes to an individual or organization that has demonstrated sustained support for advancing diversity and inclusion in the workplace and raised awareness of workplace diversity. 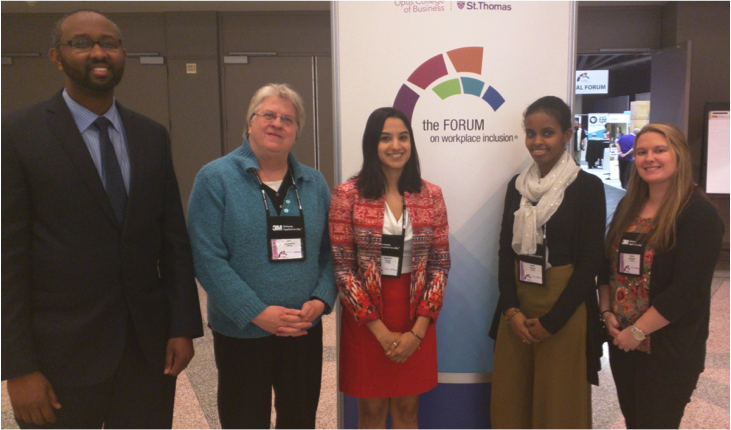 Celebrating its 28th year in 2016, the Forum on Workplace Inclusion convenes in Minneapolis each year to engage national and international people, advance ideas and ignite change around the topics of diversity, inclusion and equity. (MINNEAPOLIS, MN, 3/30/16) - The Minnesota chapter of the Council on American-Islamic Relations (CAIR-MN) today expressed disappointment at the decision to not indict two Minneapolis police officers for the fatal shooting of Jamar Clark. Hennepin County Attorney Mike Freeman announced today that his office will not bring charges against Officers Mark Ringgenberg and Dustin Schwarze for the November shooting. 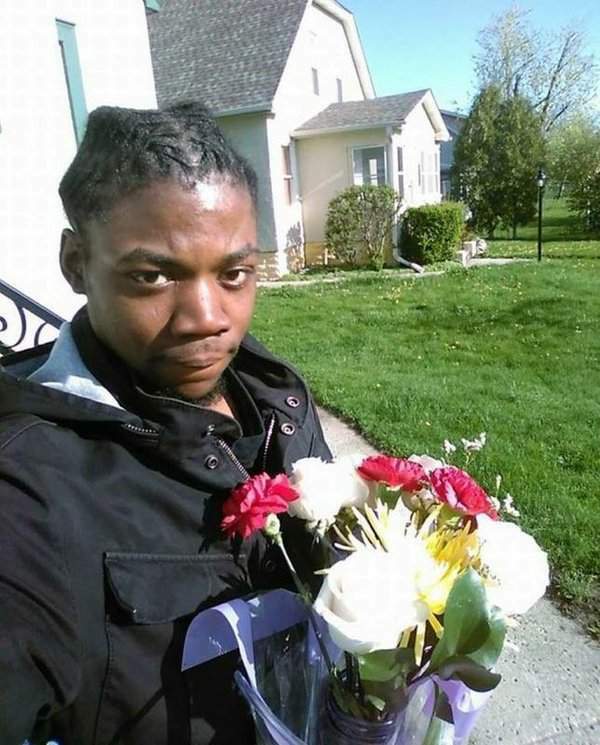 Clark, 24, died from a gunshot wound to the head after an encounter with the two officers. "We are extremely disappointed that Jamar Clark did not receive justice today. We are left with more questions than answers," said CAIR-MN Executive Director Jaylani Hussein "The video presented today appears to indicate the officers were in fact the instigators of the incident. Our thoughts are with the family." Hussein added that Clark's case is not anomaly and that there needs to be an ongoing, systemic accountability structure to transform policing and how the police and community interact. Community members are urged to join a community response gathering tonight at Elliot Park (1000 E 14th St, Minneapolis, Downtown Minneapolis) at 6 p.m. in a renewed call for justice for Jamar Clark and the African-American community of Minneapolis. (MINNEAPOLIS, MN, 3/28/16) - The Minnesota chapter of the Council on American-Islamic Relations (CAIR-MN) today join its national office in condemning the deadly bombing in Pakistan that reportedly targeted Christian families celebrating Easter. More than 70 people were killed in the blast. While Christians seem to have been the target of the attack, most of the victims were Muslim. In a statement, CAIR-MN said: "We condemn this horrific attack on families celebrating their religious holiday and seek the swift apprehension and punishment of all those involved in its planning and execution. Such cowardly attacks must be rejected by people of all faiths, whether they occur in Pakistan, Belgium, Turkey, or any other nation." "Terrorism is a global problem, and we are safer and stronger when community of all faiths, political backgrounds, and countries of origin stand up against terrorism. Those who seek to divide communities and foment hate only strengthen the hand of terror". (MINNEAPOLIS, MN, 2/26/16) - The Minnesota chapter of the Council on American-Islamic Relations (CAIR-MN) today said members of that state's Muslim community are concerned about the possible motive for a break-in and vandalism Wednesday night targeting a Minneapolis mosque. Officials with the Umatul Islam Center tell CAIR that a white male apparently in his 50s was caught on surveillance video breaking doors and windows in the mosque and stealing equipment and files. The damage estimate is more than $5,000. Wednesday's vandalism is reportedly the second such incident in the past month. A man who appears to resemble the most recent suspect was allegedly caught on surveillance video trying unsuccessfully to break into the mosque. CAIR-MN Joins a National Call to Action Rejecting Islamophobia (MINNEAPOLIS, MN, 2/15/2016) - The Minnesota chapter of the Council on American-Islamic Relations (CAIR-MN) announced today it will join a coalition of some two dozen state organizations in a national call for action and events planned across the nation this week by Stand Together Against Racism & Islamophobia (STARI). 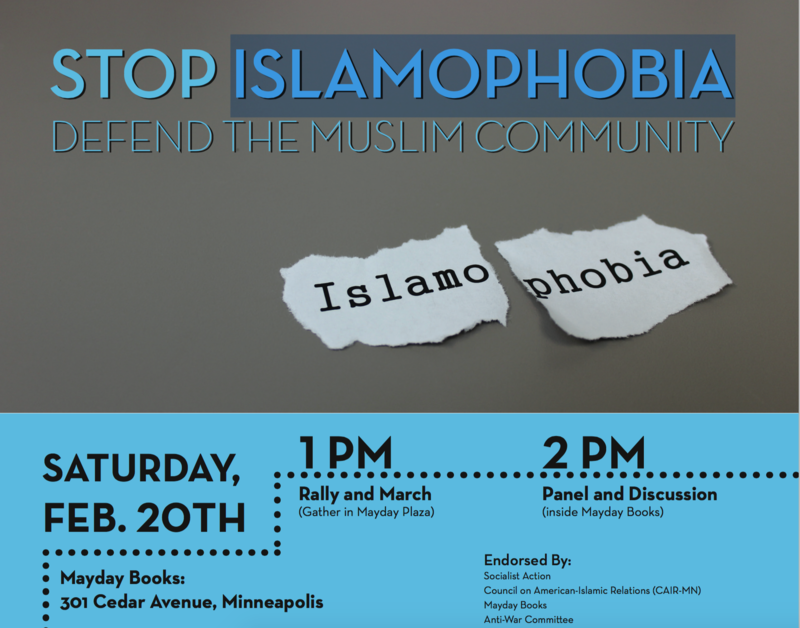 Minnesota anti-Islamophobia events include a rally, march and panel discussion on February 20. 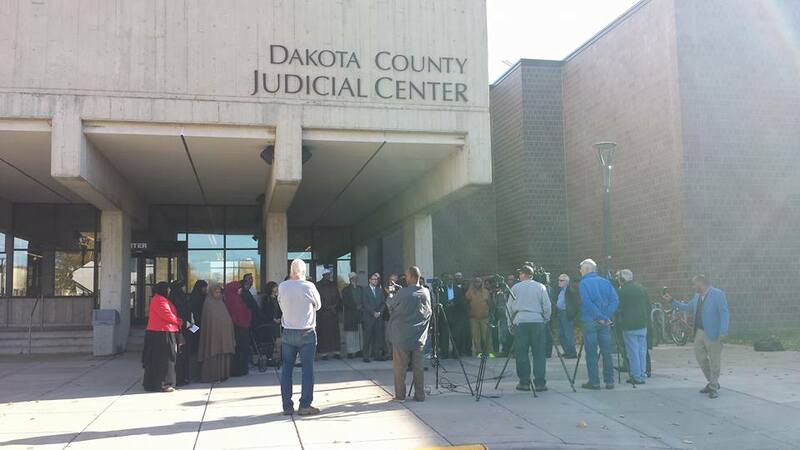 WHAT: Rally and Panel Discussion - "Stop Islamophobia, Defend the Muslim Community"
(MINNEAPOLIS, MN, 2/1/2016) -- The Minnesota chapter of the Council on American-Islamic Relations (CAIR-MN) today welcomed a Dakota County District Court judge's decision forcing Castle Rock Township to issue a conditional use permit for an Islamic cemetery. Judge David L. Knutson yesterday granted a summary judgement motion to the Al Maghfirah Cemetery Association in which he ruled that the township's decision to deny the conditional use permit (CUP) was "arbitrary and capricious" because the township did not provide any written findings of fact to support its decision. "We hoped that a simple request for a proposed Islamic cemetery in Minnesota would not need a court order, however we welcome the court's decision to grant the conditional use permit," said CAIR-MN Executive Director Jaylani Hussein stated. "This ruling sends a strong signal to those who would discriminate on the basis of religious identity."